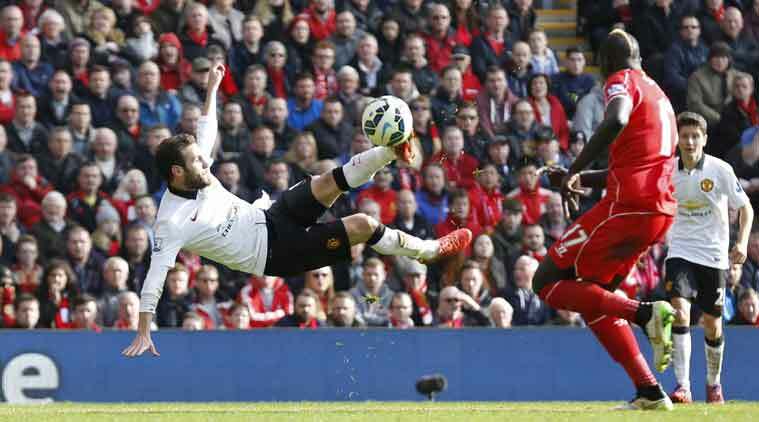 Juan Mata's marvellous volley helped Manchester United beat Liverpool in the race for Champions League qualification. Juan Mata’s marvellous volley helped Manchester United beat Liverpool in the race for Champions League qualification while his former club Chelsea nervously regained their six-point lead in the Premier League on Sunday. At the end of a week where English clubs have failed to reach the last eight of the Champions League for the second time in three years, attention has quickly turned to next term’s competition with United now handily placed for a return. Their Mata-inspired 2-1 win at Anfield left them five points clear of their old rivals in fourth, the Champions League playoff spot, as United seek a return to Europe’s top table after this season’s glaring absence. They were aided by pumped-up Liverpool captain Steven Gerrard being brainlessly sent off for stamping on Ander Herrera 38 seconds after coming on as a halftime substitute. By that time Liverpool trailed 1-0 through Mata’s neat first-half finish and the Spaniard added his second after Gerrard’s dismissal with a stunning left-foot acrobatic volley. Daniel Sturridge pulled a goal back before Wayne Rooney missed the chance to add a third when Simon Mignolet saved his injury-time penalty. “I think it’s my best game in a United shirt,” Mata, a bit-part player under Louis van Gaal until recently, told Sky Sports. “The second goal has to be up there with my best. After Steven Gerrard was sent off we needed a second goal because they pushed us to the end. Chelsea remain well on course for the title despite a lacklustre performance in a 3-2 win at Hull City. They now boast 67 points with nine matches left and have a game in hand on second-placed Manchester City. Eden Hazard’s thumping strike gave Chelsea the advantage inside the first two minutes and Diego Costa added a second to put Jose Mourinho’s side seemingly in control. But Hull responded in blistering fashion to score twice in 74 seconds. Ahmed Elmohamady first turned in Andrew Robertson’s precision cross before Abel Hernandez capitalised on a defensive mix-up between Branislav Ivanovic and goalkeeper Thibaut Courtois to level the scores just before the half hour. Courtois atoned for his error by producing a stunning treble-save to deny Hull going in front and Chelsea substitute Loic Remy made sure the West Londoners went six points clear when his 77th-minute shot squirmed under Allan McGregor. “After the international break we will go back to one match per week, except our game in hand. I believe we can finish the season very strong,” said Mourinho. United, with testing games to come against Manchester City, Chelsea and Arsenal, needed to build on last weekend’s impressive 3-0 victory over Tottenham Hotspur to keep themselves in the ascendancy for a Champions League place and eye third. Liverpool, unbeaten in the league since their 3-0 defeat by United at Old Trafford in mid-December, fell behind when Herrera’s defence-splitting pass was collected by Mata who slid the ball past Mignolet. Substitute Gerrard was dismissed at the start of the second period and United made the extra man count after 59 minutes when Mata met Angel Di Maria’s lobbed pass first time and scissor-kicked the ball home. Sturridge ignited Liverpool’s hopes when he pulled a goal back 10 minutes later but United stood firm before Rooney’s injury-time penalty was denied by Mignolet. “We were still in the game until the end and take great pride in that. The first half cost us more than the second,” said Liverpool boss Brendan Rodgers, who thanked the soon-departing Gerrard for apologising for his moment of madness. Queens Park Rangers’ hopes of Premier League survival were dealt a blow by 13th-placed Everton, who stole a 2-1 win at Loftus Road through on-loan Spurs winger Aaron Lennon. QPR remain 19th, four points adrift of fourth-bottom Sunderland.